Tsering Pani still shudders at the thought of what had transpired in her backyard that fateful night in 2014. It was peak winter. The wind was free- zing as the mercury had dropped to -40oC in her village Matho on the outskirts of the Hemis National Park in Ladakh. Suddenly, she heard a commotion in the livestock pen. She rushed out to see the thick blanket of snow outside her house covered with blood. “A shan had broken into the pen and killed all the seven Pashmina sheep. There was one missing, but the shan had probably taken it away,” she recalls. By shan, Pani refers to snow leopards that inhabit the park, spanning 4,500 sq km at an altitude of 3,200-6,400 metres. “It took us years to recover the losses,” says Pani, adding that the animal’s ultra-fine cashmere wool is a major source of living for people in the cold desert. Such stories abound in the 20-odd villages inside the park as well as those on the outside. The park is believed to have the highest density of the animal, catego rised as vulnerable by the International Union for Conservation of Nature. But, indiscriminate grazing by the increasing number of livestock across the park is fast driving out its natural preys like the Himalayan blue sheep (Pseudois spp) and ibex (Capra spp), says Pushpinder Singh Jamwal, wildlife biologist, pursuing a PhD at the University of Molise, Italy. This is the reason the shy animal is venturing into human settlements and killing live-stock for food, he says. The conflicts particularly increase in winter months when the high-mountain cat descends to lower altitudes in search of prey, and herders persecute it in retaliation. To curb the conflicts, the Jammu and Kashmir government in 1992 introduced a scheme to compensate herders if their livestock were killed by a snow leopard. The amount was just 10 per cent of the livestock price and thus did not help alleviate the situa tion. But, it did have an advantage. Officials started maintaining records of livestock killed by snow leopards. And this offered a sneak peek into the reasons and the extent of the conflict. Recently researchers, including Jamwal, analysed this data and found at least 1,624 instances of livestock depredation between 1992 to 2013. Surprisingly, the number of attacks has reduced drastically post-2002 and only two mass livestock killings have occurred since then, the researchers note in the April 2018 issue of Oryx, an international journal on conservation. So, how they agreed to a truce? Post-2002, things started looking up as various non-profits and the state’s Wildlife Protection Department (WPD) rolled out a few initiatives to help herders. One measure was to make pens predator-proof. Pani’s pen now has an iron mesh roof and an iron gate instead of the usual mud and brick structure covered with tarpaulin. “The shan was here a few weeks ago. It walked around the livestock pen for a while looking for an inlet but could not enter,” she exclaims. Another successful measure is the Himalayan Homestay programme that tapped into the region’s tourism opportunities to wean residents from pastoralism. “Pastoralism is deeply ingrained in Ladakhi society and can never be abolished,” says Jigmet Takpa, who has spent considerable time in Ladakh as the state’s chief conservator of forests. “But livestock reduction was essential to mitigate the conflict. So, we introduced alternative sources of income to reduce people’s dependency on pastoralism,” says Takpa, co-author of the study published in the Oryx. As part of the tourism initiative, local people were trained in hospitality and given culinary skills, adds Takpa. Programmes were organised to train them as tour guides during treks and expeditions. Women were trained to make snow leopard souvenirs from wool. “Today, Chadar trek and snow leopards draw tourists, some 3,000-4,000, to the region even in harsh winters, when basic services like piped water are not available,” says Tsering Sandup, executive counsellor for tourism at the Ladakh Autonomous Hill Development Council. Taking a step towards conservation of the species, the state government has for the first time decided to conduct snow leopard census. So far, a study published in Snow Leopards—Biodiversity of the World: Conservation from Genes to Landscapes estimates 516 snow leopards in the country. 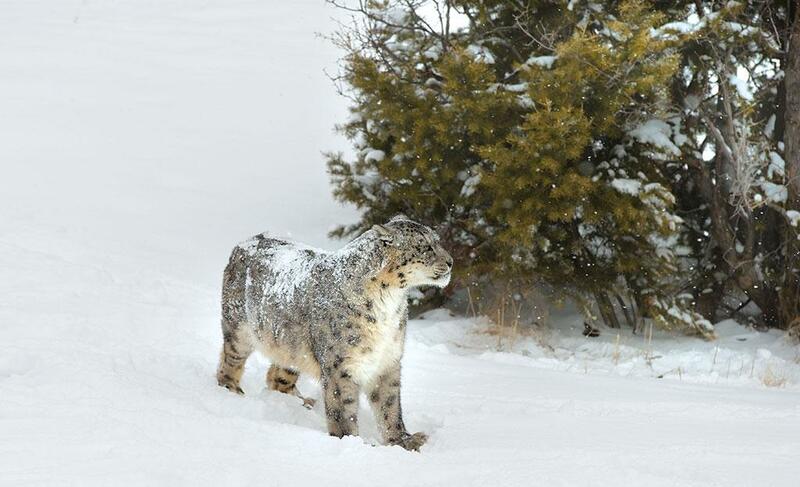 “For any conservation effort to be successful, we need a baseline data of the species, its number and the number of its prey base,” says Pankaj Raina, wildlife warden of Leh, adding that an improved prey base will help improve the number of snow leopards. The department is also working towards connecting villages inside the park which, according to Raina, “will help improve our response in case of any conflict”. (This article was first published in the 1-15 July of Down To Earth under the headline ''On path to glory').